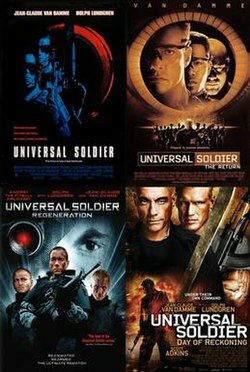 Theatrical posters of the Universal Soldier films starring Jean-Claude Van Damme. The Universal Soldier franchise is a series of science fiction action films. The franchise began in 1992 with Universal Soldier and as of 2012 comprises six entries (some of which are now considered non-canon). The films centered on the character of Luc Deveraux (played first by Jean-Claude Van Damme and then by Matt Battaglia) until Universal Soldier: Day of Reckoning, which focuses on a new protagonist named John (played by Scott Adkins). The Universal Soldiers franchise began in 1992 with Universal Soldier starring by Jean-Claude Van Damme and Dolph Lundgren. The series centers on two American soldiers, Luc Deveraux (Van Damme) and Andrew Scott (Lundgren), who are killed during the Vietnam War and reanimated in the 1990s as highly advanced Universal Soldiers. After Universal Soldier was released, Carolco, the production company that backed the film, went bankrupt and sold the rights of the series to Skyvision Entertainment, located in Toronto, in 1995. As a result, two TV films were released direct-to-video starring Matt Battaglia as Luc Deveraux and Chandra West as Veronica Roberts in Universal Soldier II: Brothers in Arms and Universal Soldier III: Unfinished Business. The films were produced for Showtime / The Movie Channel as a miniseries meant as a backdoor pilot for a series. In 1999, Van Damme returned for the fourth installment, Universal Soldier: The Return. An overwhelming critical and financial failure, The Return contradicted several elements of the previous film's plot by making Luc Deveraux no longer a Universal Soldier, giving him a daughter, and removing female protagonist Veronica Roberts. The subsequent film in the series, Universal Soldier: Regeneration, revived the franchise in 2010; disregarding the events of The Return, as well as its made-for-cable predecessors. The film featured Van Damme and Lundgren in much smaller roles, and introduced a new protagonist named John (Scott Adkins) fighting against both Deveraux and Scott. Directed by Roland Emmerich, written by Richard Rothstein, Christopher Leitch, and Dean Devlin. Starring Jean-Claude Van Damme, Dolph Lundgren, and Ally Walker. In the first installment of the franchise, American soldier Luc Deveraux (Van Damme) finds that his superior officer, Andrew Scott (Lundgren), has turned violently deranged, and the two fight to the death during the Vietnam War. After their bodies are retrieved, they are placed into a secret program in which they are reanimated and trained to become unquestioning killing machines. While Devereaux and Scott initially have no memory of their former lives, glimpses of their pasts start to return, rekindling their intense conflict. Directed by Mic Rodgers, written by William Malone and John Fasano. Starring Jean-Claude Van Damme, Michael Jai White, and Bill Goldberg. In this theatrical sequel to the original film, Luc Deveraux (Van Damme), had his cybernetic implants removed and is an ordinary human, and a single parent. He works with scientist Dylan Cotner to create a new, safer breed of fighters that are connected through an artificially intelligent computer system called S.E.T.H. (Self-Evolving Thought Helix). The project loses funding, and the supercomputer is scheduled to be turned off. To preserve itself SETH takes over a superior UniSol model (White) and kidnaps Deveraux’s daughter. Deveraux must save his daughter and prevent the machine from destroying mankind. Directed by John Hyams, and written by Victor Ostrovsky. Starring Jean-Claude Van Damme, Dolph Lundgren, and Andrei "The Pit Bull" Arlovski. In this revival of the franchise, “Regeneration” disregards the events of “The Return,” as well as its made-for-cable predecessors by beginning the film with Former UniSol Luc Deveraux (Van Damme) undergoing rehabilitation therapy in Switzerland under Dr. Sandra Fleming with the goal of rejoining society. However, when a terrorist sect uses an experimental Next-Generation UniSol (NGU) to seize the atomic reactor at Chernobyl, Deveraux is reactivated to save the planet from nuclear Armageddon. Unfortunately, Deveraux will also have to contend with his nemesis, Andrew Scott (Dolph Lundgren), a fellow Universal Soldier who's been recharged by the terrorists. Directed by John Hyams, written by John Hyams, Doug Magnuson, and Jon Greenlagh. Starring Jean-Claude Van Damme, Dolph Lundgren, Andrei "The Pit Bull" Arlovski, and Scott Adkins. Archenemies Luc Devereaux and Andrew Scott contend with a terrifying army of reanimated super-soldiers determined to infiltrate the government which they hold responsible for their pain. On October 9, 2018, Todd Black and Jason Blumenthal hired Richard Wenk to write the reboot. The story will focus on one resurrected soldier. After the original film was released, Carolco, the production company that backed the film, went bankrupt and sold the rights of the series to Skyvision Entertainment, located in Toronto, in 1995. As a result, two TV films were released direct-to-video starring Matt Battaglia as Luc Deveraux and Chandra West as Veronica Roberts in Universal Soldier II: Brothers in Arms and Universal Soldier III: Unfinished Business. The films were produced for Showtime / The Movie Channel as a miniseries meant as a backdoor pilot for a series. Directed by Jeff Woolnough, written by Peter M. Lenkov. Starring Matt Battaglia, Chandra West, and Gary Busey. This direct-to-video sequel takes place immediately after the events of the original Universal Soldier. After the terrible events of the original Universal Soldier testing, the budget has been slashed by the government; however, under the orders of a CIA director, a gang of mercenaries take control of the new line of Universal Soldiers and try to use them into helping to smuggle diamonds to the highest foreign buyer. Meanwhile, Luc Deveraux (Matt Battaglia) and Veronica Roberts (Chandra West) are in hiding on his parents’ farm. The Unisol controllers then activate a homing beacon embedded inside Devreaux’s body that makes him return to the Unisol base in Chicago where his memory is reprogrammed. Veronica follows and while sneaking into the Unisol lab to rescue Luc, she discovers that his older brother Eric, a deceased soldier from Vietnam, has also been resurrected. Directed by Jeff Woolnough, written by Peter M. Lenkov. Starring Matt Battaglia, Chandra West, Jeff Wincott, and Burt Reynolds. Luc Devereaux (Battaglia) and Veronica Roberts (Chandra West) continue their attempts to expose the Universal Soldier unit. After a hostage situation mistakenly leaves Veronica a fugitive, the two escape the city and go into hiding. Meanwhile, CIA Deputy Director Mentor (Burt Reynolds) and Dr. Walker are in the process of creating a powerful new Universal Soldier clone of Luc's brother, Eric (Jeff Wincott), to assassinate him and Veronica. "Universal Soldier: Regeneration" revived the franchise in 2010 by disregarding the events of "The Return," as well as its made-for-cable predecessors. A Collider article that focuses on "Days of Reckoning" and interviews the film's director states that the latest installment in the franchise is "either the third, fourth or sixth film in the franchise depending on if you include the pair of non-canon Direct-to-Television sequels and/or the totally retconned 'Universal Soldier: The Return';" however, minor elements from these films can be found within the canon series including UniSol clones and UniSol sleeper-agents (from II, III). Below is a table of three canon films in chronological order. Below is a table of three non-canon films: two direct-to-video films and a theatrical film starring Jean-Claude Van Damme in order of their release. A Universal Soldier video game was produced by The Code Monkeys and released by Accolade in 1992. The game was a conversion of Turrican II: The Final Fight for the Sega Genesis and Game Boy. Another version was developed later for the SNES, but it was never released.later Homebrew is the prototybe northamerica and Europe Roms Download. Universal Soldier (1971 film), unrelated British film. ^ a b c d Buckwalter, Ian (November 30, 2012). "The 'Universal Soldier' Paradox: When a Bad Franchise Produces a Great Film". The Atlantic. ^ a b c d e Daniels, Hunter (December 6, 2012). "Director John Hyams Talks UNIVERSAL SOLDIER: DAY OF RECKONING, Plus the Top 11 Things to Know About Hyams and His Film". Collider. ^ a b Benson, Jim (1995-02-05). "Carolco Sells 'Soldier' Rights To Skyvision". Variety. ^ a b McLeavy, Alex (Sep 10, 2015). "Universal Soldier may be the only series whose DTV sequels are its best work". The A.V. Club. ^ a b "Universal Soldier: The Return". Rotten Tomatoes. Fandango Media. Retrieved 2013-03-25. ^ a b "Universal Soldier: The Return". The Numbers. Retrieved 2013-03-25. ^ "A Re-Imagining of 'Universal Solider' Is In The Works With Richard Wenk Set To Write The Script (EXCLUSIVE)". Discussingfilm.wordpress.com. Retrieved 20 December 2018. ^ Jon Keeyes. "Universal Soldier 2". Cinefantastique. p. 21 – via Internet Archive. I was chopped down to basically one line in the beginning of the movie. I was not going to tell Jean-Claude that we worked together in the first one, but he remembered. ^ "Universal Soldier Franchise". The Numbers. Retrieved 2013-03-25. ^ "Universal Soldier: Regeneration". Box Office Mojo. Retrieved 2013-03-25. ^ "Universal Soldier: Day of Reckoning". Box Office Mojo. Retrieved 2013-03-25. ^ "Universal Soldier". Rotten Tomatoes. Fandango Media. Retrieved 2013-03-25. ^ a b "CinemaScore". CinemaScore. Retrieved 2018-12-12. ^ "Universal Soldier II: Brothers in Arms". Rotten Tomatoes. Fandango Media. Retrieved 2013-03-25. ^ "Universal Soldier III: Unfinished Business". Rotten Tomatoes. Fandango Media. Retrieved 2013-03-25. ^ "Universal Soldier: The Return". Metacritic. CBS. Retrieved 2013-03-25. ^ "Universal Soldier: Day of Reckoning". Rotten Tomatoes. Fandango Media. Retrieved 2013-03-25. ^ "Universal Soldier: Day of Reckoning". Metacritic. CBS. Retrieved 2013-03-25. ^ "Universal Soldier". GameFAQs. Retrieved March 28, 2013. ^ "Universal Soldier for Genesis (1992)". Moby Games. Retrieved March 28, 2013. ^ "Universal Soldier [SNES]". Unseen64. Retrieved March 28, 2013.